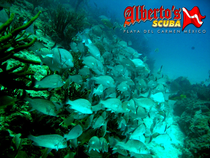 Albertos-SCUBA in Playa del Carmen offers daily: diving, snorkeling, fishing, and dive courses for all levels, from beginner to advanced. In this crystal clear water, visitors will find one of the most beautiful coral reefs in the world, with an impressive array of tropical fish, including marine turtles and sting rays. During certain times of the year it is not uncommon to see sharks, usually Bull sharks with a length of 3m . The water temperature is between 25-30 C (78-85 F), and the visibility about 30 meters (100 ft), what allows scuba diving all year round. 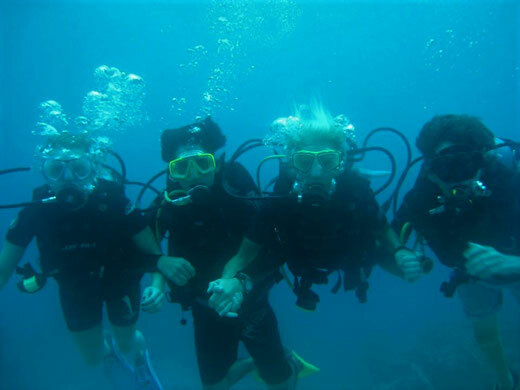 The depth of the dives is usually between 10 and 30 meters. Because of the presence of ocean currents, all are drift dives. We show you the best diving spots in the area of Playa del Carmen. Tanks, weights and the complete diving equipment are included in the price. Huge brain coral formations with a lot of fish schools, moray eels and home to many crustaceans, such as lobsters and crabs.